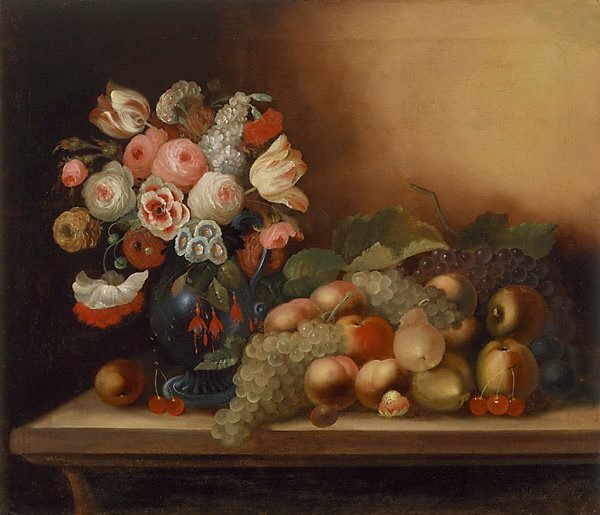 In a period when still-life painting was rare in Australia, William Buelow Gould produced a significant body of flower subjects and related nature studies. Gould's conventionalised but highly proficient style confirms a background in applied arts. Though Gould did not undertake formal art training, he executed his oil paintings with a keenly accurate eye, delicacy and refinement. Transported to Tasmania for theft in 1827, Gould worked variously in the new colony as a coach painter, scene painter and natural history illustrator, recording plants and fish for scientific purposes. His principal activity was in Launceston and Hobart, where he died an emancipated citizen in 1853. Signed and dated l.l., oil "W. B. Gould Painter 1849".